In March 2017, a New Zealand judge´s ruling--recognizing the Whanganui River as a living entity after over a century of Māori advocacy--was passed into law. The Whanganui River is the longest navigable river in Aotearoa New Zealand  and the third longest in all New Zealand . It flows through Whanganui Māori territory from North Island´s center to the west coast. The river is considered "central to the existence of Whanganui Iwi and their health and wellbeing", providing "physical and spiritual sustenance", and is seen as the ancestor of the Māori Whanganui Iwi. Whanganui Māori have long protested against their loss of control over the river, including loss of navigation and resource-use rights, and activities such as river bed works, gravel extraction, and water diversion for hydro-electric power, considering that these breach their treaty rights. Though quickly violated, the Treaty of Waitangi was signed by fourteen Whanganui Māori chiefs in 1840, guaranteeing Māori possession and control of their territory, including forests, lands, fisheries, and estates. The Whanganui Iwi´s resistance to this loss of guardianship and treatment of the river has included parliamentary petitions, reports by the Waitangi Tribunal and a Royal Commission, and a variety of legal actions resulting in court cases between 1938-2010 that fought for return of guardianship and management to the Whanaganui Iwi. In 1988 the Whanganui River Māori Trust Board was established in order to negotiate for outstanding claims by Whanganui Iwi over the river. A complaint filed by the Board in 1990, claiming a breach of the Treaty of Waitangi, resulted in a 1999 report by the Waitangi Tribunal that Whanganui Iwi rights to management and control of the river had indeed been violated. In 2003 the Board and the Crown agreed to negotiation terms to settle historical claims regarding the river. These negotiations resulted in an agreement intended to resolve grievances between the Iwi and government regarding future river management, reached in 2012 and signed in 2014, creating a new legal entity for the river called Te Awa Tupua. The agreement, called the Whanganui River Deed of Settlement (Ruruku Whakatupua—Te Mana o Te Awa Tupua), aims to uphold the spiritual relationship between the Iwi and the river and its status as a living being. The settlement´s legislation, a public act dated March 20th, 2017, brings the "longest running litigation in New Zealand´s history to an end" , and establishes Te Pou Tupua as the human face and representative of Te Awa Tupua. The bill works to establish a new legal framework called Te Pā Auroa, which legally recognizes Te Awa Tupua as a being consisting of the river "from the mountains to the sea, its tributaries, and all physical and metaphysical elements, as an indivisible and living whole" . The legislation confirms that Te Awa Tupua has all the same rights, powers, liabilities, and duties as a legal person, and these these will be exercised by Te Pou Tupua on behalf of Te Awa Tupua in accordance with the settlement terms. Te Pou Tupua consists of two people, one nominated by the Crown and one by the Iwi. The settlement also includes government payments of NZ$30 million to establish a trust fund (Te Korotete), and yearly payments of NZ$200,000 for twenty years in order to contribute to the expenses of Te Pou Tupua´s functions. There will be a River Strategy Group in order to create a strategy that those exercising powers or functions according to other legislation must take into account. The second part of the settlement focuses on cultural and financial redress for the Whanganui Iwi, including Crown apologies for past wrongdoings, authority to conduct cultural activities, official geographic place name assignments, and intentions to move towards social services projects. Please note that the 'impact' section refers to the impact of the appropriation of the river by the Crown, not the impact of the granting of legal personality to the river. 1885: Salmon released in upper river. Steamer and mail service established. 1896: Whanganui River Trust Board (WRTB, arm of Crown) established, gives management control of river to colonists. 1903: Coal Mines Act amended to vest beds of navigable rivers in His Majesty The King. 1969: Taumarunui Borough Council begins to receive annual financial compensation for diversion of headwaters, Whanganui Iwi receive nothing. 1986: New Zealand Gazette establishes water control orders over Whanganui River. 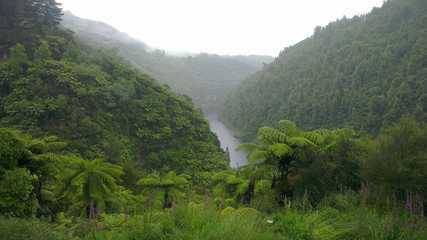 Whanganui National Park established, but due to an Iwi petition, excludes river. Minister of Lands promises Iwi participation in park management but does not follow through. 1988: Whanganui River Maori Trust Board established to negotiate all outstanding customary rights claims by Whanganui Iwi. 1990: Iwi appeal Electricorps application for minimum flow regime in river. Planning Tribunal results in minimum flow provisions. 1991: Negotiations with Crown to address river ownership framework. 1994: framework for creation of three-tupuna rohae runanga implemented. Resource Management Act prompts greater Iwi participation in consent process. 1999: Te Rununga o te Awa Tupua O Whanganui officially formed, recognized as authority for Iwi governance.